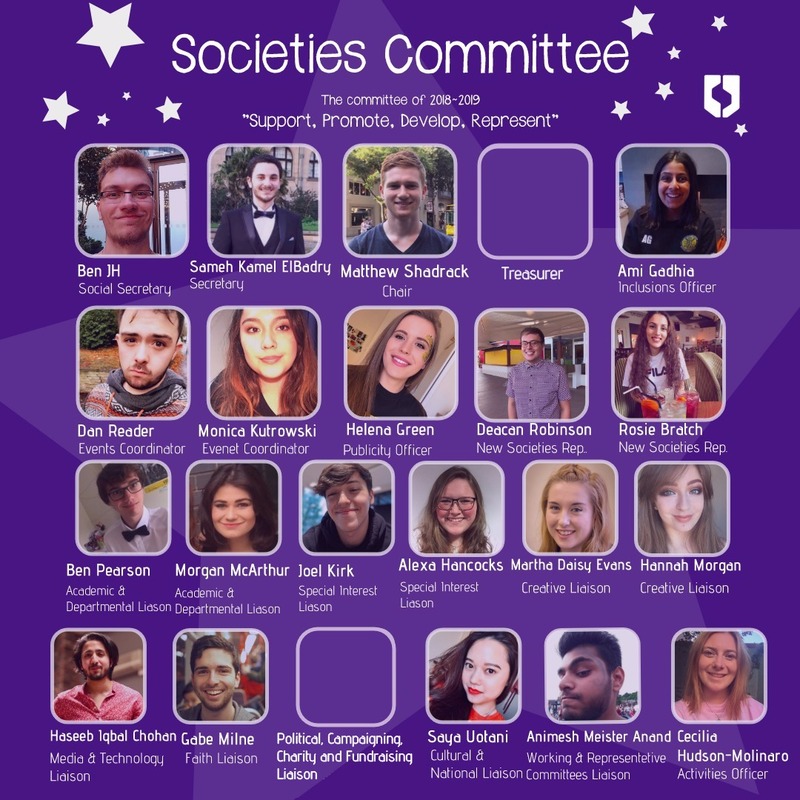 Societies Committee is a Working Committee aiming to Support, Promote, Develop and Represent all Societies and Committees at Sheffield Students' Union. Our role involves allocating funding to Societies throughout the year, considering applications for New Societies, and being the representative voice of Societies and Committees to the Activities Officer. We also organise big events each year such as Societies Takeover, ShefUniCon and the Activities Awards to show off all the amazing things achieved by students who are part of Societies and Committees! We are available to provide advice at any point during term-time, through email, Twitter, Facebook or meeting with one of our 9 Society/Committee Liaisons. We are a democratically elected Working Committee and we are elected during AGM fortnight each year. We have loads of fun throwing huge events and celebrating and supporting societies. So whether you're the president of a society or have never been involved in activities, you should think about joining us! Remember to join the appropriate group for your respective society on facebook to get all the latest news and information, and for any help with running your society or applying for funding. At the start of the year Societies Committee allocate £50 to every society which opts in for funding for their A-accounts, if a representative of their committee attends the first forum session. On top of this Societies Committee meet every week to consider applications for funding from Societies & Committees. Societies Committee are able to allocate funding to societies from 4 funds (committees can apply for the New Ideas Fund and the Collaboration Fund). The Societies Extra Fund exists to assist societies to achieve their aims and objectives. There is a £250 limit to how much you can apply for, but bear in mind that the Fund is there to support over 350 societies! Please ensure that a full cost breakdown is included with your application, including receipts where possible. Our fabulous Treasurer Daniel oversees funding applications, and is freely available to answer questions at soccomtreasurer@sheffield.ac.uk. What type of things can I apply to Societies Extra Fund for? When can't I apply for Societies Extra Funding? New Ideas Fund exists to enable societies to develop, reach their aims and objectives in new ways and explore new ideas. There is a £500 limit to how much you can apply for, but bear in mind that the Fund is there to support over 350 societies and committees! Please ensure that a full cost breakdown is included with your application, including receipts if possible. Our fabulous Treasurer Daniel oversees funding applications, and is freely available to answer questions at soccomtreasurer@sheffield.ac.uk. What type of things can I apply to the New Ideas Fund for? When can't I apply to the New Ideas Fund? There is a £500 limit to how much you can apply for, but bear in mind that the Fund is there to support over 350 societies! Societies Committee particularly look to give the money where extra costs have been incurred due to the collaboration itself. Please ensure that a full cost breakdown is included with your application, including receipts where possible. Our fabulous Treasurer Daniel oversees funding applications, and is freely available to answer questions at soccomtreasurer@sheffield.ac.uk. What type of things can I apply to Collaboration Fund for? When can't I apply for Collaboration Funding? Every week Societies Committee meet on a Monday to consider applications from students wishing to form new societies in the Students' Union. We consider these applications against a specific set of criteria given to us by the Students' Union, and decide whether to approve the new society. Click here to find more information on the process of setting up a new society. New Societies are represented on committee by our awesome New Societies Reps Rosanna and Deacan, who are freely available to answer emails to societiescommittee@sheffield.ac.uk. If the application is not made by a Full Member of the Students’ Union (i.e. a University of Sheffield student). If the activity cannot be covered under the Students’ Union’s public liability insurance (e.g. volunteering overseas, counselling, advice, guidance relating to exams, peer support, water-based activities, an activity involving motorised vehicle parts). The nature of the activity is deemed to be of such a high risk that it would require a disproportionate amount of funding and/or staff time to monitor to ensure compliance with minimum safety standards. A sport (this includes a sport recognised by BUCS, a martial art, and/or a sport recognised by Sport England, with possible exceptions for a limited range of such sports for which there are no safety or funding issues e.g. croquet). Has the primary purpose of volunteering with under-18s or vulnerable adults (these projects should be referred to Sheffield Volunteering). Has a primary aim of charitable fundraising (these projects should be referred to Sheffield RAG). Is proposing activities which have the potential to bring the Students’ Union/University into disrepute or will not further SSU’s charitable objectives. If the group is constituted or governed by an external body. If a faith group proposes to represent a particularly narrow view of a faith and/or is not supported by regional faith supporting organisations, on advice from the Chaplaincy. Whether the group duplicates the role of an existing society. How inclusive the group is & whether it has the potential to benefit all students. Whether the group has a purely social purpose. Whether the group has the minimum number of Full Members required by Societies Committee. Whether the group will be sustainable as a society. We hold three major events throughout the academic year designed to showcase the great work undertaken by the many societies here in Sheffield. These include the Dance Your Socs Off Bar Crawl, Geek Week and the Activities Awards. These are put on by our fantastic Events Coordinators Dan and Monica, who are freely available to answer emails to societiescommittee@sheffield.ac.uk. Dance Your Socs Off Bar Crawl is Sheffield university's biggest bar crawl! This year it's being held on Thursday 18Th October and is working it's way through 8 bars on West Street and then finishing of in the Students Union. There is absolutely no risk to the societies getting involved and 50p of every ticket sold goes back to the society. Dance Your Socs Off is held every year in the first few weeks of semester one; if your society is interested in participating get in touch with our Events Coordinators Dan and Monica at societiescommittee@sheffield.ac.uk. Geek Week SheffUniCon is a convention organised and run by SocCom and Special Interest Societies. UniCon features a wide range of events from life size board games, to anime showings, to a cosplay masquerade, culminating in a large scale Nerf War across the union. ShefUniCon is held every year in Spring Semester; if your society is interested in participating get in touch with our Special Interest Liasons Charlotte and Harriet at societiescommittee@sheffield.ac.uk. The Activities Awards recognise and celebrate the terrific achievements of the societies, working and representative committees at Sheffield Students' Union. The awards take place every year in May, and each year over 300 nominations are received from societies. Winning an Activities Award is a huge accolade for any society or committee, and if you are a commitee member of a winning society this is recorded on your HEAR. Nominations open in March, and Societies Commitee will be running workshops on how to make your Activities Awards applications stand out. Societies committee hosts 3 compulsory forums over the Academic year, in the Autumn and Spring Semesters and a Handover Forum towards the summer. These Forums are a great way to learn about changes that have been implemented into the Societies Committee and Activities Department, as well as meeting other societies, and attendance at the Forums is a requisite for the A-account opt-in for the next year.